With the U.S. Supreme Court’s Citizens United ruling opening the floodgates for unlimited political spending, it’s now easier than ever to buy an election. But what happens when the voters realize that the billionaires and corporations doing the buying do not have the people’s best interests at heart? This question is at the core of CITIZEN KOCH, the new documentary from the Academy Award®-nominated directors of Trouble the Water, Carl Deal and Tia Lessin. CITIZEN KOCH tells the story of the changing American political landscape through the eyes of three Wisconsin state employees, all lifelong Republicans, who suddenly find their party taking direct aim at them, stripping away the economic ground their families have built and depended on for generations. Aided by a PR blitz by out-of-state Tea Party groups, Walker successfully shifts the blame for the country’s financial problems away from Wall Street’s wild west practices and onto school teachers, sanitation workers, prison guards and nurses – many of whom were the very voters who elected him to office. After Walker rams through his “reforms,” a bi-partisan grassroots movement to recall him begins. But the recall movement collides with the Tea Party-aligned “Americans for Prosperity,” founded and lavishly financed by the world’s richest men — billionaire brothers David and Charles Koch, who are among Scott Walker’s biggest financial supporters. As Republican working class voters witness the Tea Party takeover, they are torn between loyalty to the GOP and the realization that their own party has made them the enemy. 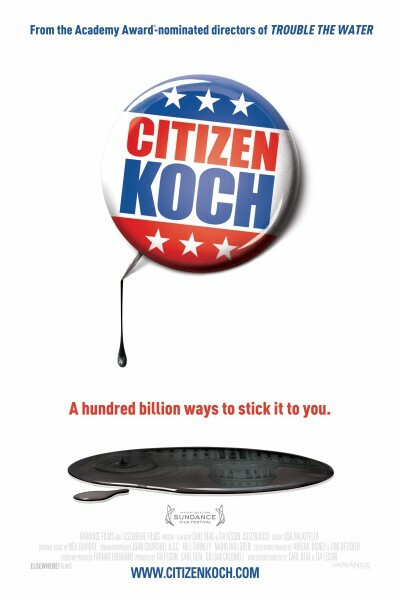 Alternately terrifying and wickedly funny, CITIZEN KOCH asks a defining question: will big money destroy not only the Republican Party, but our democracy itself? CITIZEN KOCH was supported by grants from: Chicken & Egg Pictures, Cinereach, Creative Capital Foundation, Curb Cut Productions, Ford Foundation’s JustFilms, Fork Films, IDA’S Pare Lorentz Documentary Fund, John D. and Catherine T. MacArthur Foundation, Rockefeller Brothers Fund, Kindle Project Fund of the Common Counsel Foundation, The Bertha Foundation, The Fledgling Fund, Sundance Institute Documentary Film Program and Fund.